Building on the success of 2014’s Small Town Heroes, for album number six Alynda Segarra has expanded her roots-focused folk to incorporate Latin styles and a hugely ambitious lyrical concept. 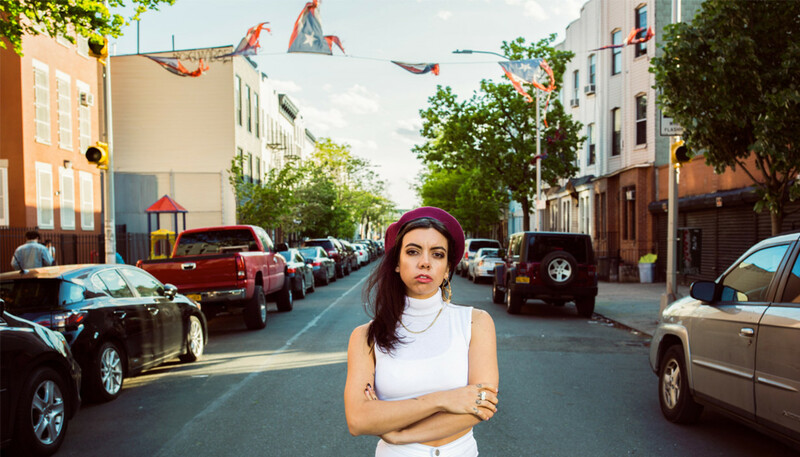 We caught up with the Bronx-raised singer-songwriter to discuss how gentrification, the rise of the alt-right and the process of reconnecting with her Puerto Rican heritage helped inspire acclaimed LP, The Navigator. The Navigator is centred around a strong concept. Could you break down the narrative for us? It’s following this young girl who’s like my alter-ego; this young, bad kid, that’s growing up in the city. It could be any city, but she’s Puerto Rican, and she’s dealing with growing up in what’s considered the ghetto or the hood, really feeling very trapped in her place in society, and where she sees herself going. And also she’s feeling very detached from her culture and her family, like she truly doesn’t belong anywhere. So she – in a ‘Wizard of Oz’-esque sort of way – asks a wise woman to make her wake up and not recognize anything or anyone around her, which also represents me running away when I was a kid. She wakes up – which is side B of the album – and she’s in the same city but it’s four years later and it’s been gentrified so much that she can just find no trace of her people and it’s a very segregated city. It’s the gentrification we see but on steroids, so the album deals with where I see a lot of cities going, and also where – on a bigger scale – politics all over the world’s going. It is very much focused on the idea that, “Well, only these certain people are worthy, and then all of these brown people? Let’s get them out of here.” You know, the idea of the “other” constantly. And it feeling like immigrants are being demonized and dehumanized all over the world, really. So it’s this dystopian, sci-fi thing that doesn’t feel that sci-fi anymore to me, sadly. How important is it to you that listeners grasp that concept? I’m very aware we live in an age where you spend so much time putting your songs in order and creating an album, but people are gonna listen to it however they want. So I tried to make an album where the songs would stand on their own – and I believe in each song as a song – but people who want to can get further into the album, and get into the imagination of the whole concept. As you say, the narrative doesn’t feel all that sci-fi anymore, particularly in the light of the US presidential election. Did that have an impact? Yeah, it definitely did. To be honest, I didn’t think that Trump was gonna win. And I thought all of this would be considered old news so I was really surprised and obviously really disturbed by the way that American politics are going. I feel like we’re running off the rails, like there’s no logic anymore; it just feels like we’ve lost our sense of gravity, you know? So, it definitely was inspiring me. And I was really, really interested in the use of language, as the campaign was going on. I was more afraid of how it would affect American culture in the long-run; how it’s already affecting young, Mexican-American kids whose family have worked really hard and might have been here for generations – or maybe they just came over – and all of a sudden they’re seen as not American, not worthy, and alien. These concepts that were being thrown around, so I wanted to use some of that language. The idea of “the wall” is very symbolic. I’m not the first person to write songs about walls, obviously, and in The Navigator, the people of the city are getting walled-off because they’re seen as not needed anymore. Their neighbourhoods have been taken over and they’re being kicked out. That’s where Navita [Milagros Negrón], my character, finds the people of her neighbourhood; they’re all on a little area called Rican Beach. “Rican Beach” feels particularly pertinent, dealing with ideas of cultural appropriation and displacement. Tell us more about that song. I moved to Nashville for two years and that was my first time really feeling out of place. You know, I had lived in New Orleans for a long time, I grew up in New York City, and in Nashville was where I felt like, “Wow, who am I? Where do I come from?” I suddenly felt like I couldn’t really fit in with this very white, Americana folk scene anymore. It started to feel more and more like, “I come from a different place and I’ve gotta start dealing with that, and understanding what that means.” So I was doing a lot of research into Puerto Rican history and just starting to really understand what it means. What were the key reference points from Puerto Rican culture? Well, I was learning a lot about the Young Lords, who were a group in the 60s and 70s of young activists from the island. They were really inspirational to me, especially because, even though it was the early 70s, the women of the Young Lords were demanding to be in the same positions of power. There was a big push to work on getting rid of machismo and homophobia. All of a sudden it clicked in me that I make sense. You know, I’d been told my whole life by white people that I don’t act Puerto Rican; that I act white. And that has always made me feel very strange, like, “Wait, so, what do Puerto Rican people act like, then? What does that mean?” And it means, “You don’t act like the stereotypes we see on TV.” When I learned about the Young Lords I was like, “I make sense. I act like a Puerto Rican woman.” Puerto Rican women are rebellious and they’re artists and they’re activists, and that’s really important for me. Musically, you’ve incorporated some of that Latin heritage into this album too. Yeah. Well, my dad is a musician and I grew up hearing him play Latin jazz and salsa, and I was so rebellious – or I thought I was – like, “I listen to punk-rock.” I could have learned so much more from him and sadly I just wanted to get away from all of that. So it felt really good to go back and listen to a lot of that, especially stuff on Sonja Recordings. Sonja was a record label based in New York City in the 70s and salsa came about because there was a bunch of young kids who were playing little bits of folk music but not getting it perfect for the purists. They were like, “Let’s just create our own genre.” So when I finally understood that concept, once again I was like, “Oh, I’m just gonna do that! That’s what I do with folk music from Appalachia anyway, and now I’ll just bring in these rhythms.” It finally dawned on me that I don’t have to be a salsero; I don’t need to be anything other than myself while bringing in these influences. Can you tell us more about “Pa’lante” – it’s a phrase that means “forward”, like a rallying call, right? Yeah, and to me it’s definitely an inspirational concept of not giving up, to keep pushing, and to keep going forward. I thought that it was a really important concept to put out right now. Because I feel like in order for us to go forward we also have to understand where we come from, really getting in touch with our ancestors to make things right for them, and to heal for them. I think it’s something in the States that a lot of people are very scared of, because their ancestors have done things that are very cruel. It’s very scary for certain people to go back because they don’t want to feel responsible for those deeds, when really what you can do is you can go back, and say, “Wow, this is where I come from, and now I’m going to make it right. I’m going to move forward and push for justice and for freedom for people.” You know? So it’s this concept of going back in order to go forward and to make a better world. Have you experienced similar abuse yourself? I mean, I definitely think I’ve had it really easy, comparatively. I really don’t get a lot of hate. But I see it, mostly with women artists online – there’s just such a desire to kick us off the internet. But we haven’t toured the album in the States yet, so we’ll see. I really try to keep my message to these very simple ideas, like equality for every human being is important. I believe that peace and love are important concepts, and that’s starting to be controversial, sadly. Where do you look to for hope for the future? I really believe in the generation that’s coming up. These kids don’t believe in gender, they’re just like, “This is so silly – you should be whatever you want and you should use whatever bathroom you want.” There’s this real freedom, this desire to work together, and also a very big desire to protect the planet. They are very aware of the situation we’re in right now, and they don’t want to inherit an Earth that is uninhabitable, you know? So that’s what gives me hope, honestly.